There were 633 press releases posted in the last 24 hours and 153,947 in the last 365 days. 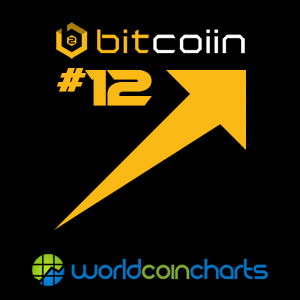 Bitcoiin B2G announces its breathtaking rise to a #12 market cap ranking by WorldCoinCharts.com. While Bitcoiin B2G was designed as a unit of exchange, the current appreciation in value has rewarded early adopters and traders very substantially. HONG KONG, CHINA, April 17, 2018 /EINPresswire.com/ -- Bitcoiin B2G (www.bitcoiin.com), currently trading at $58.15, announces its breathtaking rise to a #12 market cap ranking by WorldCoinCharts (www.worldcoincharts.com). This means that only eleven world cryptocurrencies (including original bitcoinrev and Ether) rank above Bitcoiin B2G in total market capitalization. In 24-hour trading, on April 14, 2018, Bitcoiin B2G had a total market cap of $2,907,597,254.50. That reflects a coin price of $58.15. Bitcoiin B2G started trading on Monday, April 9th, at $5.00 per coin. The 24-hour volume now stands at $22,309,635.00. Current coin circulation remains at 50,000,000. This advance reflects a 16.3% upswing in value, over the last 24 hours, from $48.64 to $58.15. If trends continue, B2G will break the $3B market cap barrier soon. This astounding performance (with no end in sight) reflects continuing market optimism and trader support. Continuing Acceptance: The Bitcoiin B2G ecosystem, designed for explosive global growth, is now a setting the pace in the global cryptocurrency marketplace. We are working to develop enhanced services, just as our merchant recruiting enters high gear. The Bitcoiin ecosystem has successfully implemented a comprehensive ecosystem, a unique standalone solution for borderless trade, unbanked populations, and anonymous transactions, including asset transfers. This ecosystem includes the B2G cryptocurrency, B2G Wallets, and the Thorex.net trading platform. Thorex.net, currently upgrading to a new server farm, has been designed and built to accommodate transfers from Bitcoiin B2G to other cryptocoins and global fiat currencies. A Unique Opportunity: Cryptocurrency enthusiasts, depositors and adventurers have found opportunity buying, selling and trade Bitcoiin B2G. Catch the wave. To sign up, purchase Bitcoiin B2G, convert tokens to Bitcoiin B2G, wallet-store and trade, see: www.bitcoiin.com .